An Amtrak Cascades train from Portland arrives in Albany one Saturday in May. Back to trains for a moment, if you don’t mind. More specifically passenger rail. Once again, in advance of next year’s legislative session, there’s a question whether the Amtrak Cascades train service between Eugene and Portland will continue beyond June 2017. It’s an expensive proposition to keep the six daily trains running. (When they’re running, that is. For July 5 and 6, they were canceled because of work on the track, Amtrak’s website says.) 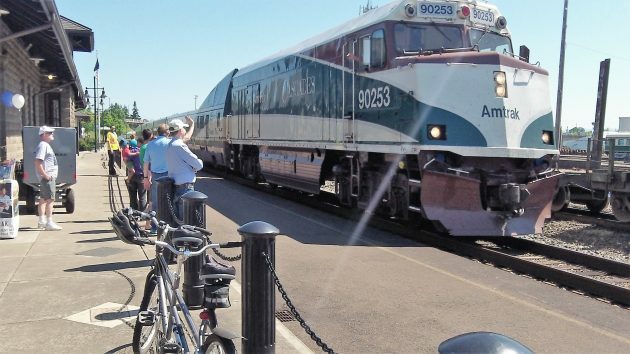 For the current two-year budget period, the state of Oregon is paying Amtrak $17.5 million. With nearly $4.9 million in maintenance and repairs, plus about $5.7 million for services and supplies, Oregon’s total expenses in the 2015-17 budget period top $28 million. The state rail budget assumes that passengers will pay Amtrak some $6.5 million for tickets and snacks. So passengers pay less than 20 percent of the program’s cost. And according to a budget analysis for the legislature, the ODOT Rail Division estimates the “all-inclusive passenger rail subsidy in Oregon” at $120 per passenger. The passenger project has been working since 2012 on a plan to increase rail service, but the going is agonizingly slow. They are now working on the draft of an environmental impact statement analyzing two “build’ alternatives and one “no action” alternative. The proposed preferred alternative is to use the existing Union Pacific line and add four round trips a day between Eugene and Portland. Public hearings on the draft likely will be held in 2017. Then the Federal Railroad Administration eventually will decide on the preferred alternative. But after that, nothing further happens unless and until Congress approves money to make all the track and related improvements to allow for eight more daily passenger trains on the UP track. We’re talking hundreds of millions. So don’t hold your breath. Passengers arrive in Albany aboard the Amtrak Cascades. 1. Navigating their website is no more difficult than most others. Have a friend walk you through it the 1st time. It’s no different than learning how to use any other tool. A couple of times and you’ll be teaching others how to do it. 2. Taking the car (while it may give you the feeling of being in control), is very taxing mentally when having to continually look out for the other idiots on the road as you’re going through metropolitan areas. Take a book, some headphones, and *relax* on the train! Can anybody say “free enterprise?” If the people want it, they should pay for it. We’re paying double for highways and trains and the ridership of trains obviously does not merit them. Cut Amtrak loose from subsidies and see what happens. That’s exactly what should happen. I love taking the train to Portland or Seattle, but if you want to travel cross-county…you can fly first class for the same amount. And it’s not the cost of the ticket that makes it so expensive, it’s the cost of a sleeper. Last time I checked, it was somewhere around $350 a night. I ride Amtrak frequently. I take the Starlight to the Bay Area overnight, or come back from there. As such I am an Amtrak supporter. However, Amtrak has serious customer care issues, which need to be addressed. The largest issue is the restroom situation. It is the number one reason that my family dreads taking the train. I understand it is a challenge due to the large number of people on the train, however the cleanliness of the restrooms is always an issue. Better and cleaner restrooms are needed. However, a larger issue is customer service. This past week, when I came home I traveled Thursday night to Friday afternoon. 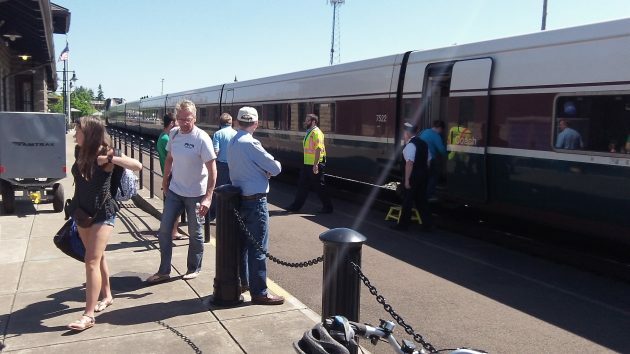 The train was originally scheduled to come into Eugene at 12:30 p.m. After tickets were sold to passengers, they changed the time to 2:30 p.m. Then, during the trip, it slipped another two hours to 4:40 or so. The issue was this. I met two moms and one grandmother from different families. Two who were crying, one who was very angry. The situation was that their daughters were participating in the the Olympic trials in Eugene. This was a once in a lifetime opportunity to be there to see their children at the trial. All three of them missed them, as they competed between 4:00 and 5:00. The issue with Amtrak care, was that this could have been prevented for these mothers. By the time the train hit Sacramento, they knew it was going to be a close call, as the original 12:30 arrival time was already not going to be met. They asked Amtrak to transfer them to a bus in Sacramento, so they could make it on time. Amtrak flat out refused, saying ‘they don’t do that.’ Yet this is hogwash, Amtrak puts folks on the bus all the time in order to make train connections due to delays. I met another family who was traveling to Seattle, and they missed the LA connection, and they were bused from LA to Sacramento to catch-up with their train. The issue here is that there may be an official policy that Amtrak cannot put all passengers on buses due to late trains. We understand that. But companies with decent customer service realize that there are exceptional circumstances that allow rules to be set aside. I think the once in a lifetime chance to see your child compete in a spot for the Olympics meets this criterion. Amtrak turned a cold shoulder, and lost customers for life. They had a chance to make it right, but they showed no compassion whatsoever. This is my observation, from a person who believes in passenger rail service in this country. The only people who can ride the train are those folks who do not need to be anywhere on time…… this country will never adopt trains again until they know what time they will arrive. We should not spend millions of dollars to fund something for people who do not pay the bill so that they can always be late arriving…. I disagree. Not with the item about arriving on time, as that is true. But about that being the only folks who travel by rail.. I have seen that many folks take Amtrak for other reasons. 1) Folks with medical conditions which prevent flying. 2) Elderly folks for whom airline travel is too hard. 3) Americans (and a large number of visitors from other lands) who want to ‘see’ America rather than fly over it. I have met a surprising number of Amish families who travel by Amtrak. 4) Folks with small children who would not do well on a flight. 5) Folks who need to travel without much notice due to work or personal demands. That is, if one needs to travel within 10 days time say, airline tickets are unaffordable. 6) Folks who do not have a car or a drivers license (some overlap with elderly folks here). There is a lot of overlap here between folks who ride Amtrak and those who use city buses (which I also use). I also know that some folks oppose taxes for city buses for the same reason. However, I believe that we have an obligation as a society to allow the poor, and the old, and those with medial conditions, the ability to navigate their city and their country. As a generalization this is wrong. The few times I’ve taken ALY to SEA I have needed to be on time. Work was required and a series of markers needed to be met. Deadlines need to be met. To do that, I simply booked the ticket with enough spare time. Then enjoyed the ride.